NORWALK, Conn. – State legislators from Norwalk are targeting dyslexia, cannabis and hemp, animal cruelty, board of education chair selections, and gentrification with bills introduced at the beginning of a new legislative session. Expenditures for Norwalk Public Schools represent 53.8 percent of the 2018-19 Norwalk operating budget, according to budget documents available online. Mayor Harry Rilling said Friday that he was not aware that Duff was proposing this bill. State Rep. Gail Lavielle (R-143) has introduced 31 proposed bills, including one to “require physicians, advanced practice registered nurses, physician assistants and nurses to be trained in recognizing symptoms of Alzheimer’s disease and dementia,” that is co-sponsored by Dathan, Simms and State Rep. Themis Klarides (R-114), who is House Minority Leader. Lavielle has introduced a bill to eliminate the estate and gift taxes and another concerning a pilot program for regional marketing and economic development in Fairfield County. HB05001 An act ensuring that students in this state receive high-quality skills training. She is not listed as cosponsoring bills. HB06257 An act concerning environmental justice. She’s not listed as co-sponsoring bills. The Leagues of Women Voters of Norwalk and Stamford are cosponsoring a meet and greet from 2 to 4 p.m. Sunday at Norwalk High School, located at 23 Calvin Murphy Drive, with featured speaker Terri Ann Lowenthal discussing “The Census: Why It Matters To Every Community,” according to a press release. Norwalk’s elected and appointed officials are invited and there will be time for audience questions. And another political power play by Duff … can’t allow the Board of Education to select a chair who won’t cowtow to the Mayor, can we? This list reminds me of the old saying that ‘no one’s liberty or property is safe while the legislature is in session’. A statewide property tax of one mill? A state bank?!! Hello Charles Keating!! A state wide auto tax “capped” at 37 mils…you know that the cap usually gets Duffed. 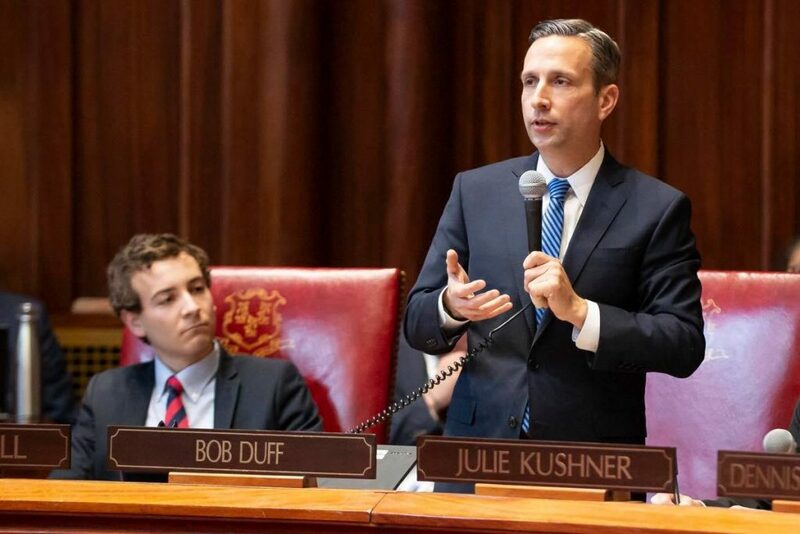 Ever the one inventing solutions in search of a problem, let’s hope Senator Duff doesn’t get any ideas about legalizing murder just like NY did. What we expect from Norwalk’s Legislators. Noise. CT’s reputation remains unchanged. Call the movers. HB06014 An act prohibiting the use of leghold and body crushing traps. Finally Bob is going after taxes and other absurd undertakings by our State. What’s the deal with HB06222 from Lucy Dathan. Did she even read the text of her own bill? It mandates that school can’t start before 8 a.m. at any level, then states its purpose as “permitting school districts to start later”. Which is it another unfunded mandate, or are we allowed to govern ourselves at a local level? At least SB0006 on Net Neutrality is very explicit that they want to make our cable and internet bills more expensive, with fewer choices. The regulation authority will come under PURA, which is an appointed board of mostly former Democrat lawmakers with zero utility industry experience pulling down high six figure salaries. So far they’ve done a bang up job making our electricity costs the highest in the continent. Can’t wait to see how much my cable bill can go up for lousier service. Wow, and I thought i had a lot of bills! Do any of these bills address the basic issues behind CT’s decade long failing economy and Exodus of jobs, firms and residents ? The list itself makes a good case for a full time Legislature rather than part timers with Day jobs. I totally disagree with the BOE bill. This stems from personal issues that has taken place where the BOE has not agreed with State Legislators in the city of Norwalk. Talk about a politician trying to make something personal. With all our problems under Dan Malloy in the past eight years – I would think they would have something better to focus on. How about jobs? How about lower taxes? How about how to bring companies here? How about reducing the number of government legislators? How about tort reform? How about finding better health insurance solutions? But this is where the focus is? Where are the bills on these issues? @Nora King, yes! Totally agree. @Nora. This isn’t the first law Duff has tried to pass to undermine the city’s right to govern itself. He passed a law last session to handcuff our schools and even used his influence to get the Commissioner of education to question us. But, this shouldn’t surprise anyone. Anyone who has closely followed Duffs career know that hie has successfully stripped ever increasing amounts of revenues away from Norwalk, while managing a few crumbs here and there not even keeping up with population and inflation growth rates. Now he’s off chasing the Net Neutraility windmill, an industry regulated by the Federal Government, that he thinks now needs state controls and fees and fines and all sorts of other goodies. If he had an economic clue, which he doesn’t, he’d realize that this is just another costly measure that will guarantee businesses take theirs elsewhere. In the meantime, there is nothing in this list that solves any of the major problems facing our state. Nothing. How about open dialogue and conversation instead of demands and taking absolute positions? It always amazes me when some people can stand up and scream for their cause and at the same time shame the other side. The role of the “high and mighty” in this community is unbelievable. Everyone wants better schools, better infrastructure but when asked to pay the excuses come flying in. Blame the past, blame the politicians, blame the unions… blame blame and more blame, never a momentary pause to search inward and find a solution that fairly burdens everyone with the cost of the needed solution. How about some help with insurance costs? work to support a family = $1800 a month with 12k deductible! So among the depressing wasteland of terrible proposals, there’s at least that small glimmer of entertainment. I have to pay a kid $15 an hour on his first day to learn how to wash dishes or map a floor? Then I have to automatically give proportionate raises to the people that are already doing those jobs so they don’t get mad? And then I also have to give ALL my employees paid sick leave even if they ALL don’t deserve it. You can’t treat good employees the same as bad employees. That’s unreasonable and unfair. Only a communist would like that. President Trump said (14:47) in today’s Rose Garden Border Wall address that he may transport and “release” illegals into the states and districts of congressmen and senators who won’t vote for proper border security walls. I think that means us. If an employer can’t afford 15 bucks an hour they should go out of business. My lowest paid employee makes 25 bucks an hour. I would take a pay cut myself before I would lower an employees wage. I look at my employees as an asset not as a cost. It’s about time the right wingers do the same. An Act Raising The minimum Wage. Paid family wage and oh yes then an act to help small business. Help small business do what? Help us Rent moving van’s to get out of here? I think Bob and Nancy need to get out more often and talk to people who actually provide services and pay for all this waste. @ Ken Wow Ken you must be a millionare. So Stew looks at his employees as a cost? You must run a law firm. Sign your full name as well. Well, Spain nearly destroyed its economy going in full bore for its own version of a ‘green new deal’ (Spanish unemployment rate now 15.2% [after hitting 27% at the height of its ‘green’ efforts]; U.S. unemployment rate 4%); why not duplicate those achievements in CT? After all, we know how much better politicians can grow an economy than free enterprise can – just look at the success story known as Venezuela! All hail the People’s Republic of Connecticut! HOLD ON TO YOUR WALLETS!! !